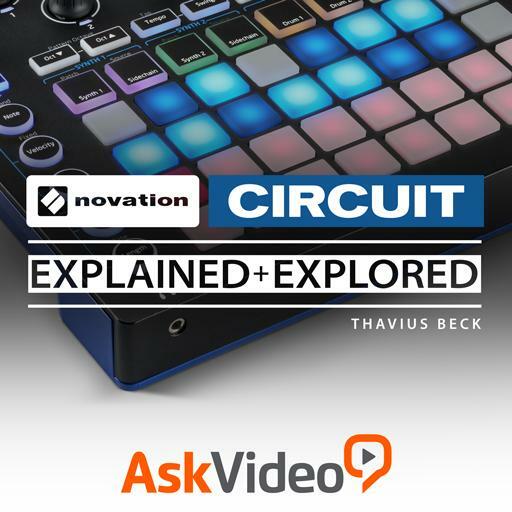 Circuit 101 - Novation Circuit Explained and Explored. True or False: Each Drum part uses all 32 steps for sequencing. True or False: Drum sounds are velocity sensitive when played in realtime. How many total drum sounds does Circuit have? True or False: Automation can be recorded directly to Circuits sequencer. A single Pattern consists of how many steps? True or False: Synth part 1 defaults to a polyphonic patch. True or False: You can solo sounds in the Mixer. True or False: Grooveboxes always require a computer to work. True or False: The default scale for synths is the Chromatic scale. True or False: Circuit has delay, reverb, and chorus effects. True or False: Circuit allows you to add negative swing (make notes play earlier). True or False: You can only automate four of the 8 synth parameters. True or False: It is possible to filter individual drum sounds. Can each saved session have different sounds and scales associated with them? Can a monophonic synth be loaded onto Synth 2? Can a pattern be an odd number of steps? What does the Velocity affect? True or False: Each step in the sequencer can have different parameter values. True or False: Circuit has 64 session slots.